Vintage style glass 250ml mini milk bottles with a black, silver or gold twist off cap. Fabulous, cute looking bottles. Perfect for wedding favours, children's parties, baby showers, filling with your favourite sweets, juice, milkshakes, sauces and dressings or for the vintage look, try putting some flowers in, the choices are endless. If you are looking for a larger bottle, we also stock 500ml and 1 Litre milk bottles. 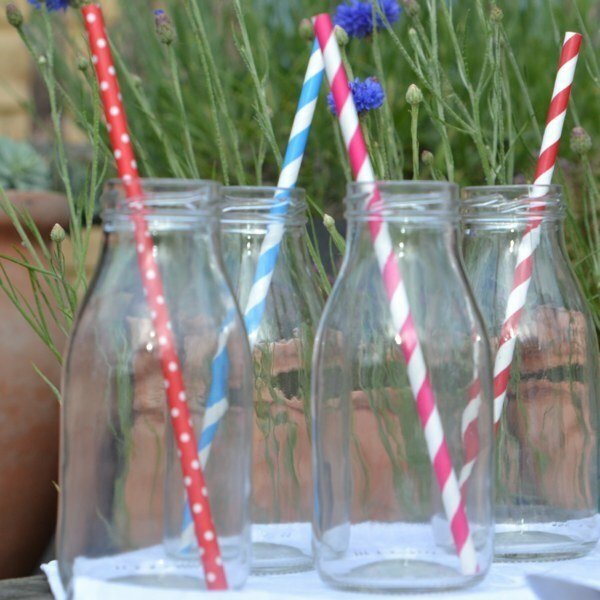 Straws in photograph are not included, Red and White, Blue and White straws can be purchased separately please use search bar for Straws.